Santa Claus youngest Son, Scotty, is getting into the family business. 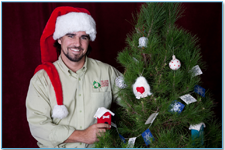 Scotty Claus - Martin from Los Angeles, CA represents the "new age" way in buying and recycling Christmas tree's. Keep the tree's alive and re-use the same Christmas Tree year after year. Can you imagine the memories your entire family will cherish watching them all grow up along side a real Living Christmas Tree as it to changes with the seasons and matures into a Family Tradition. The best part is you only take care of your tree during the Holidays and then a crew comes by and takes it back to the tree farm until next year. Have you been to a landscape nursery lately? I have and there is nothing cheap about buying a nice living tree. On average an evergreen tree (the ones used for Christmas Tree's) grows only 1 foot per year. A typical 7' to 8' tree is at least 7 years old and if you think about it, it's a real shame that the majority of all Christmas tree's end up in the landfill after the Holiday's. Even as a young kid I could never get over the fact that we threw something away that just a few weeks earlier was the center piece of the Holidays. My Mom actually agreed and the next Christmas we bought a live tree that was already sheared into a Christmas Tree. Even to this day I can still smell the aroma that filled our living room long after Christmas was over. She even decorated it during Easter. True Story. But by the time Summer came around our Live Tree wasn't doing so well living in the house and we ended up planting it in the backyard. If there had been a business like the Living Christmas Tree back then it would of been the perfect alternative. You get all the benefit's of a real live tree but without all the trouble in keeping it alive til the next Holiday Season. Having a trained crew deliver it and then pick it up is also a great convenience when deciding on a live Christmas Tree verses a dead or fake one. "Scotty Claus" Martin is the ultimate Holiday Recycler. Each and every year his tree's serve their purpose and then have the chance to continue growing for another season. Every year that tree has saved the life of another tree that would of ended up in the landfill which makes this the ultimate "green" tree. He doesn't stop at just recycling Christmas Tree's, he also recycles ribbons, bows, wrapping paper and a bunch of unique ornaments. Scott will also have his elves pick up unwanted merchandise laying around and donate it to a charity making his service a perfect Eco-green company. 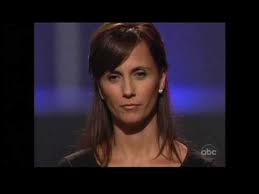 So how will the Shark Tank treat Scott Martin? This is a tough one. I Love The Idea and the whole concept but I'm not exactly sure how you would go about taking this business and growing it to the financial numbers the Sharks are used to. 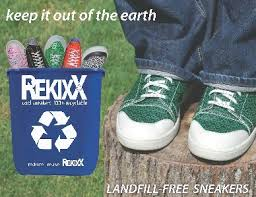 They have a huge selection of recycled products that could be expanded on (easy to send anywhere) and possibly a franchise play on the Christmas Tree Rental Program? I'm not sure but it will be interesting to hear Martins plan on taking this unique business to the masses. This will give a lot of good publicity and awareness that there is an alternative to cutting down a tree just to throw it away a few weeks later. 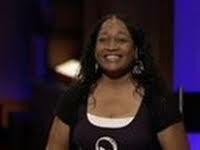 Remember The Shark Tank Christmas Episode is this Tuesday, December 4th at 8 p.m.
Make sure you spread the word. The more of us watching this episode, the greater the chance the Shark Tank Show will get moved to a new and better time slot. Love the concept and now a generous billionare backing it. Mark Cuban was most interested in how many vets his investment would gets jobs. @Mcuban you da man. I wasso glad that Mark Cuban saw the potential in this business. As he was listening, I felt the same way about his opportunity- it just seems like a great idea. No job/business comes easy, but I wish I could learn from these great investors! (Wishing they had free courses!) #LoveSharkTank! I definitely agree! I was happy that Mark saw the potential in Scotty's biz. I believe that he will do great in this career. Saving God's creation is the best thing to do! Great pitch and love the idea! Good idea, get a real tree without killig one. It would be good if you could buy them and keep them outside year round and brought in during the holiday. would be cool to just keep the tree and plant in back yard too…the city of Los Angeles is cutting down gorgeous trees in record numbers…leaving trash all over the streets. I would buy today if they were in Tampa for all the above reasons! I'm really hoping Mark Cuban will bring this to Dallas, TX because I will DEFINITELY use this service next year! I love having a live tree and I'm excited that I won't have to wait until just before Christmas to put up the tree. I can have a real tree the day after Thanksgiving like my friends with fake trees do. There is enough that's fake about the holiday already, I love that someone out there is keeping it real! Love this business so glad Mark went in with him. Wish him much, much! 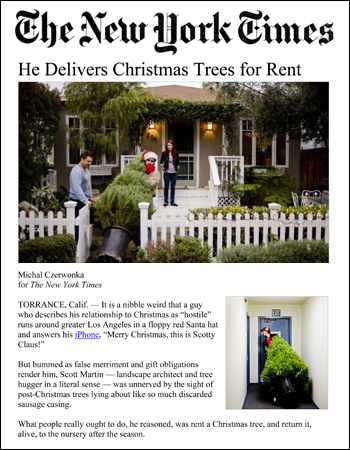 If he made his prices more competitive with what the reality is of buying a tree, this business would be a slam dunk. Sadly, $100-200/tree probably isn't going to do it! I'm looking at my dried up tree right now..what a waste. I love the whole package sounds perfect..only thing is I live North of San Francisco, in Napa Valley. Will you be expanding this way? I'm really impressed that Mark Cuban invested in this company with his decision primarily based on doing the right thing and creating more jobs for veterans ... which makes him a true American with a big heart and a little more dolphin than shark. wish you had this company in Illnois. I would love a live potted tree for christmas. I gave away my plastic tree years ago. I had a real tree last year and put it out for the animals to use for the rest of the winter. I hated killing a live tree. I don't think I will put one up this year. I wish this company was in Florida. I've been dealing with artificial trees for years because I can no longer find live trees the still have a root system. And being in Florida they don't tend to fare well in this heat. Please come to Florida for Christmas!